In H.D.’s poem “Helen,” the author writes through the point of view of Greece to critique Helen’s beauty and character. Helen was a part of the ancient Greek aristocracy who left her husband in Greece for another man in Troy sparking the Trojan War. Throughout the poem the narrator watches as Greece degrades Helen’s appeal slowly turning her to stone, only to praise her in death. Although this poem is narrowly describing Helen’s transformation from life to death- it more broadly encapsulates the idea that females fade into obsoletion when they defy male norms. Through the ironic use of a blazon, poignant imagery, and strategic rhyme the author creates a poem so eerily written it makes the reader feel as if they are slaves to the patriarchy like Helen. The narrator parodies the tradition of a blazon by listing Helen’s physical traits and instead of praising them, meeting them with sharp criticism. Helen is described by the narrator as having “still eyes” and growing, “wan and white”. These judgements asserted by Greece go against the tradition of a blazon because this format was traditionally reserved for praiseworthy assertions about a woman’s physical beauty. By parodying the tradition of the blazon, the narrator encourages readers to recognize the disparity between theory and practice when it comes to this idea of an “ideal woman”. This incessant hatred launched by an entire country to a single woman envokes a sense of sympathy in the reader. The mocking of Helen’s figure also connects back to H.D.’s thesis of misogyny. When a woman defies her husband and by extension the patriarchy, she is turned into an object of hate for Greece. There is also extensive use of imagery throughout the poem which also suggests that Helen is gradually turning into a statue. At first the narrator can see, “the lustre of the olives” in Helen showing the reader she is vital and beautiful. However by the end of the second stanza she grows “wan and white” highlighting her symbolic transformation to a statue in the face of hate. Through men’s constant criticisms’ Helen’s individuality and “lustre” begins to fade; the traits that made Helen beautiful by Greek standards are now the exact things being criticized and silenced by her home country. After her transformation into an obsolete statue at the end of the second stanza, there is a shift in tone. By the third stanza Helen is praised again as the narrator describes her as, “God’s daughter” and having the “slenderest knees” emphasizing that Helen can be admired- but only in her death. This transformation connects back to the overall message of misogyny: marble statues are beautiful to look at and idealize, however in practice they are not their own living, breathing entity capable of making change. 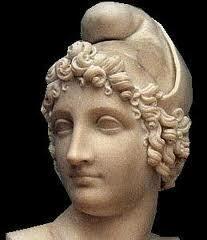 Helen is now idolized for her beauty, but was hated by Greece for her decision to go against her husband’s wishes. Although “Helen” does not have a set rhyme scheme, there are patterns of rhyme in the poem itself. In the first stanza it’s the words “stands” and “hands”, the second stanza has rhyme pattern between “reviles” and “smiles” and yet again in “still” and “ills”, and the third stanza rhymes the words “maid” and “laid”. There are also instances of alliteration in “Helen”- especially in the second stanza between the words “wan” and “white”. The poem also uses repetition in both the first and second stanzas by beginning with the word “all”. The lack of set rhyming structure leaves the reader unsure of when to anticipate another rhyme. The repetition and alliteration also are used to make the reader feel uncomfortable with the structure of the poem itself. Both these literary devices are used to make readers feel uneasy and are meant to mimic the feelings of Helen. Helen’s decision to leave her husband left her in a position of uncertainty and unease. With constant criticisms from Greece, her uncertainty was only magnified until she reached a point where she had to relinquish her individuality to please the masses. This entrapped feeling is mimicked through the unpredictable diction patterns used by H.D. When also evaluating the structure, the poem itself is only eighteen lines. The narrator’s unfeeling callousness towards Helen is swift and conveyed through this short format. Even looking more broadly at the structure of the piece- the wording and format are concise. This stylistic choice made by H.D. helps portray Greece as swift and cold in their defamation of a now beloved icon. These narrative choices portray Helen as a victim to the unforgiving Greece. By parodying the blazon, Helen’s figure is mocked and distorted until her essence is given up when she metaphorically transforms into marble. Through H.D.’s precise imagery, the reader is able to clearly comprehend the damage Greece has on Helen’s psyche and the extent of her transformation. Lastly, through the author’s command of structure, the reader feels just as trapped as Helen did, envoking a sense of sympathy from the reader. Helen is viewed as a problematic figure who is neutralized by incessant hatred and dies from said trauma, only then is she praised again by society, after she is no longer a threat. The misogynic defiance of Helen’s choice lead her to be “hate[d]” by all of Greece, this text proves H.D.’s larger message of females having to sacrifice their personality to fit into male ideals.